Cuijk (Dutch pronunciation: [kœyk] ( listen )) is a municipality and a town in upper southeastern Netherlands of pre-historic origin. Its existence is recorded on the Roman roadmap Tabula Peutingeriana under the name of Ceuclum. Cuijk is twinned with Maldon in Essex, UK. It is a big commuter town with very good public transport services to nearby Nijmegen. The nearest hospital is at Boxmeer and the nearest international airport is situated in the German town of Weeze. Cuijk has a railway station on the Nijmegen to Venlo railway. 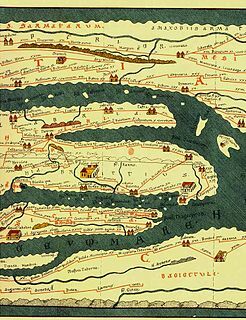 Tabula Peutingeriana, also referred to as Peutinger's Tabula or Peutinger Table, is an illustrated itinerarium showing the layout of the cursus publicus, the road network of the Roman Empire. Tholen is a 25,000 people municipality in the southwest of the Netherlands. The municipality of Tholen takes its name from the town of Tholen, which is the largest population center in the municipality. Raalte is a municipality and a town in the heart of the region of Salland in the Dutch province of Overijssel. Gennep is a municipality and a city in upper southeastern Netherlands. It lies in the northern part of the province of Limburg. Furthermore, it lies on the right bank of the Meuse river, and south of the forest of the Klever Reichswald. The municipality of Gennep has 17,277 inhabitants (2014). Mook en Middelaar is a municipality in the upper southeastern part of the Netherlands, at the northern tip of the province of Limburg and is a part of Stadsregio Arnhem Nijmegen. The municipality is located about 100 km from provincial capital Maastricht and has an area of 18.81 km2 (7.26 sq mi) of which 1.42 km2 (0.55 sq mi) is water. Voerendaal is a municipality and a town in the southeastern Netherlands. Brummen is a municipality and a village in the eastern Netherlands. Overbetuwe is a municipality in the province of Gelderland in the Netherlands. It was formed on 1 January 2001 as a merger of three former municipalities: Elst, Heteren and Valburg. Overbetuwe is bordered in the north by the river Rhine and in the south by the river Waal. The city hall is located in Elst, the largest town in the municipality. Together with eighteen other municipalities it forms the 'Knooppunt Arnhem-Nijmegen', or simply 'KAN', which is a regional collaboration. IJsselstein is a municipality and a city in the Netherlands, in the province of Utrecht. IJsselstein received city rights in 1331. IJsselstein owes its name to the river Hollandse IJssel which flows through the city. It is a major commuting suburb for the Utrecht area, along with neighbouring towns Houten and Nieuwegein. It's surrounded by the municipalities of Utrecht, Montfoort, Lopik, Vianen and Nieuwegein. Nieuwegein[ˌniʋəˈɣɛi̯n](listen) is a municipality and city in the Dutch province of Utrecht. It is bordered on the north by the city of Utrecht, the provincial capital. It is separated from Vianen to the south by the river Lek and borders on IJsselstein in the southwest and Houten in the east. Etten-Leur is a municipality in the Dutch province Noord-Brabant. Its name is a combination of the two towns from which the municipality originally arose: Etten and Leur. Nowadays both towns have grown into one. Mill en Sint Hubert is a municipality in southern Netherlands. Oirschot is a municipality and a town in the southern Netherlands. It is situated 12 kilometres (7.5 mi) from the city of Eindhoven and 20 kilometres (12 mi) from the city of Tilburg in the province Noord-Brabant. The municipality had a population of 18,599 in 2017. Rucphen is a municipality and a town in the southern Netherlands between Roosendaal and Etten-Leur, south of the railway, but without a train-station. Sint Anthonis is a municipality and a town in the southern Netherlands in the Province of North Brabant. The locals refer to the town as Sint Tunnis. An inhabitant is called a "Sintunnisenaar". The municipality had a population of 11,582 in 2017. Medemblik is a municipality and a town in the Netherlands, in the province of North Holland and the region of West-Frisia. It lies immediately south of the polder and former municipality of Wieringermeer. Sliedrechtlisten is a town and municipality in the western Netherlands, in the province of South Holland. The municipality covers an area of 14.01 km2 (5.41 sq mi) of which 1.18 km2 (0.46 sq mi) is covered by water. Beek is a town and municipality in the southeastern Netherlands, in the province of Limburg. As of 2012, Beek has a population of about 16,400, of which about 8,800 live in the town of Beek. Meierijstad is a municipality in the province of North Brabant. The municipality is the result of a merger between the municipalities Schijndel, Sint-Oedenrode and Veghel in 2017. After the merger it became the largest municipality in terms of land area of North Brabant. The town of Veghel hosts the town hall, while the municipal council holds its meetings at the former town hall of Sint-Oedenrode. ↑ "College" [Board] (in Dutch). Gemeente Cuijk. Archived from the original on 8 May 2014. Retrieved 8 May 2014. ↑ "Postcodetool for 5431BV". Actueel Hoogtebestand Nederland (in Dutch). Het Waterschapshuis. Retrieved 8 May 2014.